Pearle has teamed up with SOSCuisine to help hockey players perform at their very best, by offering their busy family dedicated meal plans. SOSCuisine’s online meal planning service, which includes recipes and grocery lists, makes it a breeze to put Pearle’s sound advice in practice, on a daily basis. The strategic collaboration also involves Pearle doing one-on-one sports nutrition consulting through SOSCuisine’s VIP Dietitian service. Your browser does not support frames. &lt;a href=”http://globalnews.ca/video/1168533/the-nutrition-edge-for-hockey-performance”&gt;Click here to view the frameless video.&lt;/a&gt;. 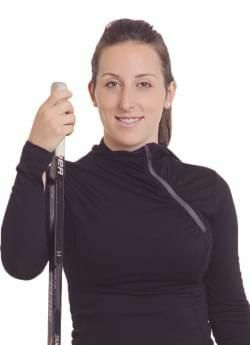 Pearle Nerenberg specializes in consulting hockey players from elite to recreational level. Her expertise comes from a Masters degree in sports nutrition combined with 26 years of involvement in the hockey community – playing (NCAA level), coaching, and organizing hockey associations. Pearle is the Chair of the Hockey Nutrition Network. And, she is co-author of the 2014 edition of The Nutrition Edge for Hockey Performance which is now available to order. Pearle is owner and founder of Nutrition Athletica, a nutrition consulting company specializing in working with the active and athletic population. She has teamed up with Lolewomen (#loleambassador) to encourage women to feel good being active in addition to eating well for their sport. Pearle is a regular guest on Global Montreal’s Morning Show where she shares tips and insight into current hot nutrition topics. Pearle is a new mom of a baby girl, an avid runner, a self-labeled foodie, and a country girl at heart as she grew up in a beautiful, untamed part of Quebec’s Laurentian Mountains.